Google Analytics is an amazing, free tool for learning more about the people who visit your website and it is incredibly valuable in helping to decide where to focus your energy to improve your site. If you don't have any kind of analytics set up on your website, stop what you're doing and add Google Analytics right now. We add Google Analytics on all of our websites and your basic setup gives you a ton of great information, but there are a few really easy ways to improve the basic Google Analytics setup and get much more value from the data. And the best part is you can make all of these changes in less than 15 minutes! Annotations are an oft-forgotten tool in Google Analytics because they're kind of hidden. They're really helpful however, when you're looking back at your analytics data and can't remember why a particular traffic spike occurred or how the change you made to improve volunteer submissions actually worked out. These annotations show up across all your analytics reports and they can be great indicators for how a particular change affected your site. We always add an annotation to indicate when a new website launches so we can quickly see how the website activity differs between the new site and the old one. It's really nice to be able to quickly determine for example, that a new website led to a 275% increase in organic search traffic and a 27% increase in the time on site. Custom reports are a little bit complicated. Fortunately, the folks over at Econsultancy put together a list of 10 valuable Google Analytics custom reports that you can enable with almost no effort. UPDATE: Google has also put together a more extensive list of easy-to-implement custom reports, dashboards and advanced segments. There are a variety of reports that will be helpful for different kinds of organizations but the first six are super handy for pretty much everyone! Once you've added the custom reports, you can view them in your Google Analytics by clicking on the 'Customization' tab at the top of the page. See if your site is performing poorly in a browser. Maybe there's a bug you haven't seen yet. This one only needs to be done if visitors can search your site for content that they're having trouble finding. It's particularly useful because you can quickly see what content you may need to consider placing in a more obvious location or what topics you should be writing about if the content doesn't exist. Use your investigative skills and locate your search term in the URL. The word or letter just before the equals sign is your query parameter. In my example, the query parameter is the word "keywords". You can ignore everything else. Once you've enabled Site Search Tracking, you can see what people are searching for by going to Content -> Site Search -> Overview in your Google Analytics. It's important to note that it can take up to 24 hours before Google Analytics starts recording visitor searches so if you don't see anything there immediately, give it a day and check again. Adding event tracking is a little intimidating at first because you have to dive into HTML of a site in order to add it. If you know what to look for and use a few helpful tools though, it's as easy as copying and pasting! At a minimum, you should add event tracking to important offsite links like social media or email marketing subscription buttons (that go directly to a vendor like Constant Contact, Mailchimp or Campaign Monitor). You can also add event tracking to file downloads like important whitepapers, affiliate links or when someone clicks the 'play' button on a video. 2) adding that code on your website. Fortunately, the kind people over at GAconfig have made both parts super easy and you can simply go to gaconfig.org/google-analytics-event-tracking and follow their instructions. To make things even more clear however, we'll walk through a real-life example – adding Event Tracking to a Facebook link. In the Category field, put "Social Media"
In the Action field, put "Facebook"
In the Label field, put "Like" or "Click"
In the Non-Interaction field, select "true" if the person will leave your site when they click the link. In this case, they will be taken to facebook.com so select "true"
onClick="_gaq.push(['_trackEvent', 'Social Media', 'Facebook', 'Click',, true]);"
That's it! You're half-way there! Part 2 will vary depending on your specific website setup but for the sake of this example, I'll assume that you have some kind of Content Management System (CMS) where the Facebook link exists in a WYSIWYG editor (if your site isn't powered by a CMS, let us know and we'd love to see if we can help make your life much easier!). Click on the HTML button. You will see a bunch of HTML pop up. Paste the code from Part 1 after the a Facebook link quotation mark but before the first '>'. Playing around with the HTML may seem daunting at first, but once you do it a couple times, it'll become second nature! Now that you've set up an event to track, you can actually view the data in your Google Analytics by going to Content > Events > Overview. Event tracking can be used in a lot of different ways to better quantify how visitors interact with your website. Goals are the foundation of reporting concrete successes (or failures) of a website. There are variety of different ways that you can measure those successes but it's important to establish at least one measurable goal for your website. Setting up goals is particularly useful when you want to see how a particular blog post or marketing initiative lead to conversions on your website. 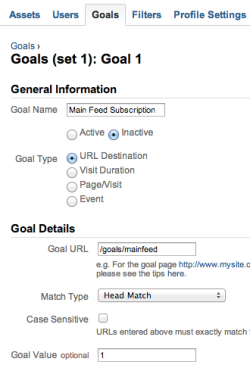 Goals are often used in conjunction with Event Tracking. The goal value is usually used to associate a monetary value to a certain action on the site. For example, if 20% of people who fill out a contact form on your site end up becoming a customer and the average value of a customer is $200, then the goal value would be $40 (or 40). If you aren't selling a product or trying to acquire customers, you should still set up a goal value relative to your other goals on the site. For instance, newsletter subscriptions might be worth 1 and volunteer signups might be worth 5. By incorporating these five Google Analytics additions, you are setting yourself up to be able to see a much clearer picture of how visitors navigate your site, how they got there and how you can improve their experience. Let us know if you have any other great ways to improve Google Analytics! Instantly retrospectively applied annotations to mark website milestones which will need to be fleshed out over the next few weeks but got the key relaunches done. Thanks. First, I'm glad you found the post helpful! I like to use the category label as the top-level breakdown of the things I'm trying to track. As I mention in the post, I love http://gaconfig.com/google-analytics-event-tracking/ to make Event Tracking as easy as possible. I also use their Step 1 dropdown menu as a guide for what to use as the different categories in my Event Tracking. For example, you may want to use 'Videos' as one category, 'Social Media' as another, and 'File Downloads' as a third category. For the Action field, I like to use something general that may be true across multiple categories, like 'Click' or 'Play' or 'Download'. I use the label field to note what is is the user is clicking, playing or downloading. For you, it might be one of the 'Tweet', 'Like', or 'Email This' buttons on one of your blog posts.